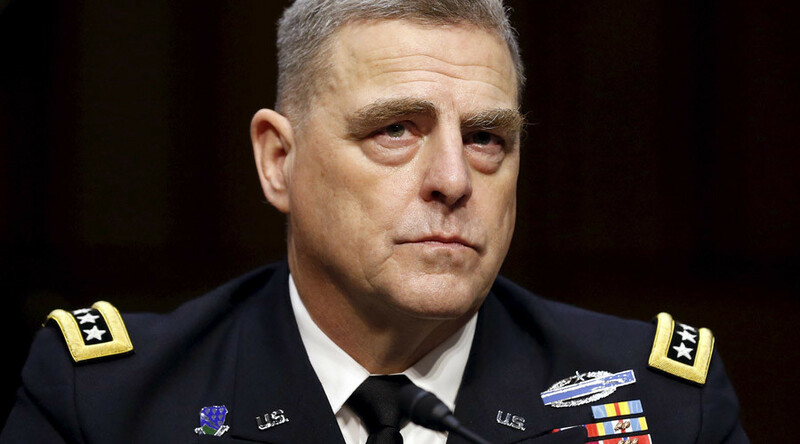 Fresh back from Kiev, Army Chief of Staff General Mark Milley called Russia “aggressive” and “adversarial to the interests of the United States,” claiming that having nuclear weapons and the ability to use them makes Russia the foremost threat to the US. If that sounds familiar, that’s because Milley used the exact same phrases during his confirmation hearing before the US Senate this July. The only difference is that he wore a blue service uniform then, and chose a camouflage combat uniform (ACU) for his conference appearance Monday. 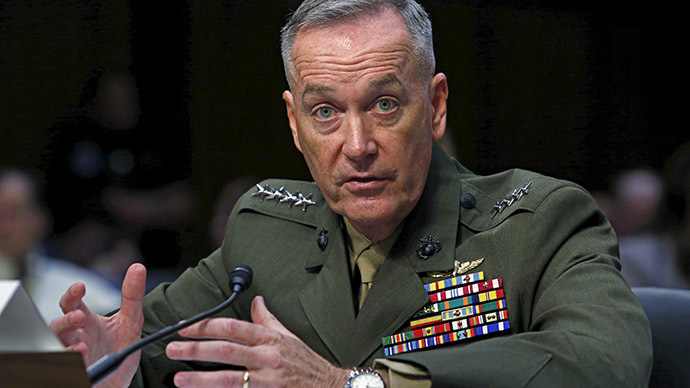 What’s more, the phrasing most likely was not even his own: Two weeks prior to Milley’s confirmation hearing, General James Dunford used the exact same language at his own Senate confirmation hearing for the post of Chairman of the Joint Chiefs of Staff. Dunford previously commanded the US Marine Corps. “I would say that Russia’s recent behavior is adversarial to the interests of the United States,” Milley said, citing “aggressive” exercises and patrols by Russian aircraft, submarines and troops – inside Russia – for the past “four-five-six-seven” years. “Russia bears close watching,” the general added. Diplomacy is a “bit more nuanced” than a binary calculation, he noted. 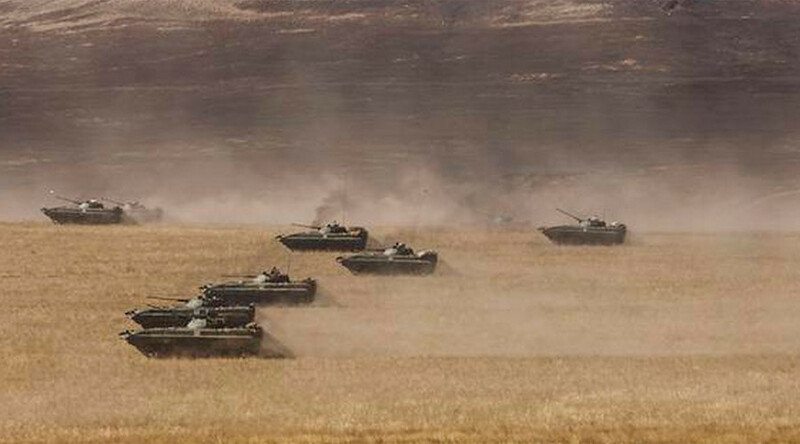 While Russian “aggression” should be fought with sanctions and NATO posturing, the US should work with Moscow on matters of mutual interest and convenience, such as the Iran nuclear deal. This just happens to be the official party line of the Obama administration, as espoused by Secretary of State John Kerry, Secretary of Defense Ash Carter, and President Barack Obama himself on a number of occasions. Between the talking points and clichés, such as “Freedom isn’t free,” Milley leavened his presentation with references to the army’s favorite book on military philosophy, On War, which was written almost two centuries ago by Prussian officer Carl von Clausewitz. The unfinished book was published in 1832, following Clausewitz’s death during a cholera outbreak. Though many of his observations have been questioned since, and others grown into truisms from overuse, Clausewitz at least knew a thing or two about Russians, having fought alongside them against Bonaparte in the Napoleonic wars. Instead of honoring the Pentagon tradition of treating his audience to a PowerPoint presentation, Milley offered canned responses to questions from Fox News defense analyst Jennifer Griffin. One of Griffin’s remarkably insightful inquiries was whether the US could defeat Russia in a ground war. “Our capabilities today are plenty good enough to deal with anything that Russia has,” Milley retorted, ignoring his own words about Russia’s nuclear capabilities. Milley had the unenviable job of arguing that the US Army was not “hollow” and could do everything asked of it, while at the same time pleading for more funding, troops and gear. “To maintain our way of life, to maintain a military that protects that way of life, is a very expensive endeavor,” he said.